Will they ever ask us what we want, or do we always have to ask what are we allowed to? April 8, 2016 — Berlin 2 p.m. Many people plan what they want to do with their lives. They think about what job or profession they want to pursue, and where they want to live. Others just dream that they will someday have the freedom to make such choices. Many people have to fight a lonesome struggle, living under inhuman conditions, and struggle to get through the bureaucratic red tape. Year after year they receive only the status of “toleration” (Duldung); forced to live in cold, overfilled, temporary tents. They face unfair, cut short legal proceedings, and deliberate segregation. They live from day to day in fear of being picked up in the middle of the night and deported. That is reality in the Federal Republic of Germany today. According to the Flüchtlingsrat (Refugee Council) , there were thirteen thousand seven hundred forty-three people deported in the first half of 2016. Five thousand seven hundred seventy-six of them were sent to supposed “safe countries of origin”. Thirteen thousand seven hundred forty-three! That is not just a number. If one looks at that humanly, it is: one + one + one + one + one . . . and so on, and so forth. 13,053 Human beings, of all ages and personal histories, all fighting in hope to escape the situation where they have no rights. From one day to the next the school benches are emptied. Co-workers and neighbors are nowhere to be found. People, who did not “voluntarily” choose deportation to the supposedly “safe” lands of origin in the West Balkans, are banned from re-entry for many years. Families with children who were born here in Germany and never saw another country, are sent to Kosovo, Macedonia, Serbia or Bosnia and Herzegovina. The term “economic refugee” is just a rhetorical means to ignore the persecution, and the real reason they fled those countries; or worse, to vilify them. The right to asylum, historically, is supposed to protect human lives, but today applicants for refugee status are divided into categories, a hierarchy of pain and misery. Reports from refugees prove the violations of human dignity and human rights rampant in the refugee camps in Germany. There are also studies which prove the continued violations of human rights including children’s rights. The inhuman situation in the countries of origin has also been proven. In those countries, where it is supposed to be safe, the situation is really life threatening, especially for minorities such as Rom*nja. Even impoverished members of the majority nationality have a hard time surviving, people who are politically active, or women and children threatened by physical violence or those who have unpopular ideas or, or, or… have a much harder time finding a place of refuge. One thing is “for sure” we cannot accept the German government’s idea of what is “safe”. With the effort to classify, even places like Afghanistan and Iraq, as “safe” we can expect lots of deportations and revolving door court procedures for refugees. Many other countries are likely to be added to the list of “safe countries of origin”. The very term “safe country of origin” is a tool that turns reality upside-down. The purpose is to facilitate mass deportations. Who is likely to be next? Will it be Tunisia, Morocco or Algeria? There are negotiations going on now with many countries about so called “deportee readmission”. These take place under duress. If these countries refuse to cooperate, there could be cuts in development assistance and an end to trade relations. We sharply criticize these (neo-)colonial relationships. It is not the people who flee who are the problem, it is the reasons for their flight that must be solved. Most people do not flee their homelands voluntarily. They leave because the basis of their lives and livelihoods have been destroyed. The deal with Turkey and closing off Europe at the borders killed more people in 2016 than previously, and this humanitarian catastrophe is being continued in 2017. The first International Rom*nja Day in was in 1971. 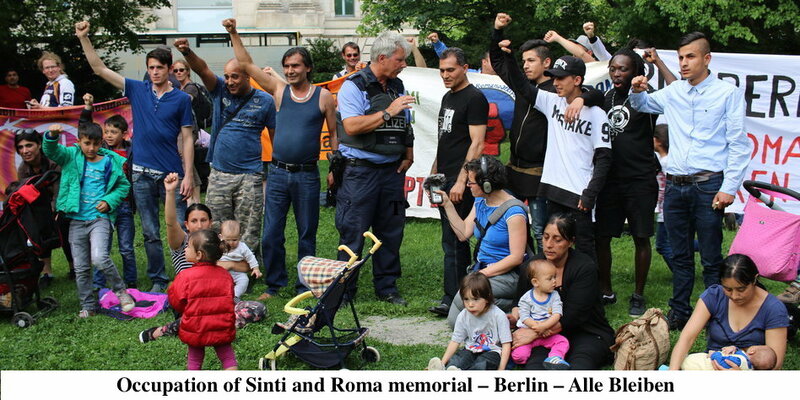 It continues to celebrate the resistance against attacks on Romani lives and identity. Also this year, we use this day to fight for self-determination and a humane future. In solidarity with all refugees we demand Take Back the Future!